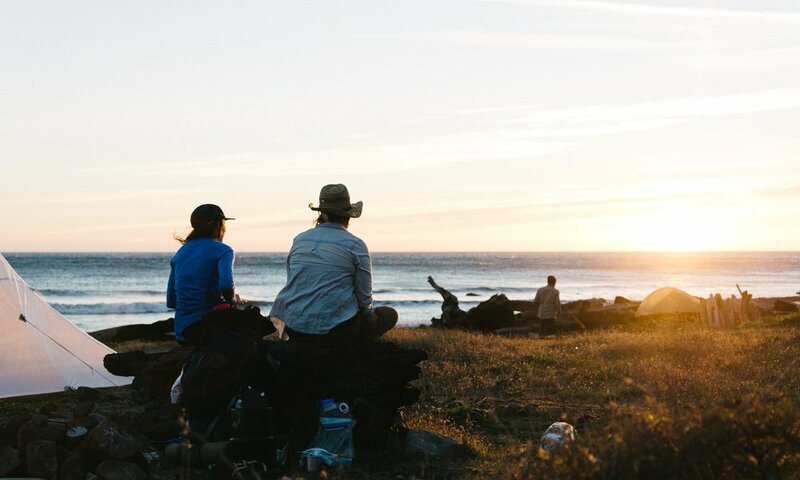 Explore the CA coastline's most REMOTE AND RUGGED WILDERNESS area; they tried to build Hwy. 1 here, but there were too many dramatic cliffs. so you can show off your skills next time you pitch a tent (we'll make sure you look like you've been doing it since you were a kid). Late morning meet up at Black Sands Beach Trailhead for Opening Ceremonies and gear packing. *Exact arrival time depends on our hiking speed and traffic, but anticipate an after-dinner arrival. Every single Trail Mavens trip starts with strangers. But don't worry - if you're nervous about not knowing anyone or not being skilled enough, every woman says this before they go. To feel more confident before signing on, read our (extremely detailed) FAQs for all the intel you need. Backpacking bowl, mug, and utensil (a Tupperware bowl, heat-proof cup or mug, and any fork/spoon/spork set is just fine! Trail Mavens follows Leave No Trace principles, and we'll be pooping into catholes in the backcountry and packing out all our toilet paper and feminine hygiene products. Participants are responsible for their own transportation to and from the Lost Coast, a four and a half hour drive from the Bay Area without traffic, but we help coordinate carpools for ladies leaving from SF and Oakland. Each passenger will contribute to her driver to cover gas and wear & tear. If no trip participants/insufficient trip participants own cars, we'll share contact information so you can band together and split a rental. Want even more details on carpooling? Check out our Transportation FAQ. Plan to book flight arriving in the Bay Area no later than Thursday evening, and departing no earlier than Monday morning. Additional questions? Check out our FAQ, email hello@trailmavens.com, or join one of our upcoming online info sessions!